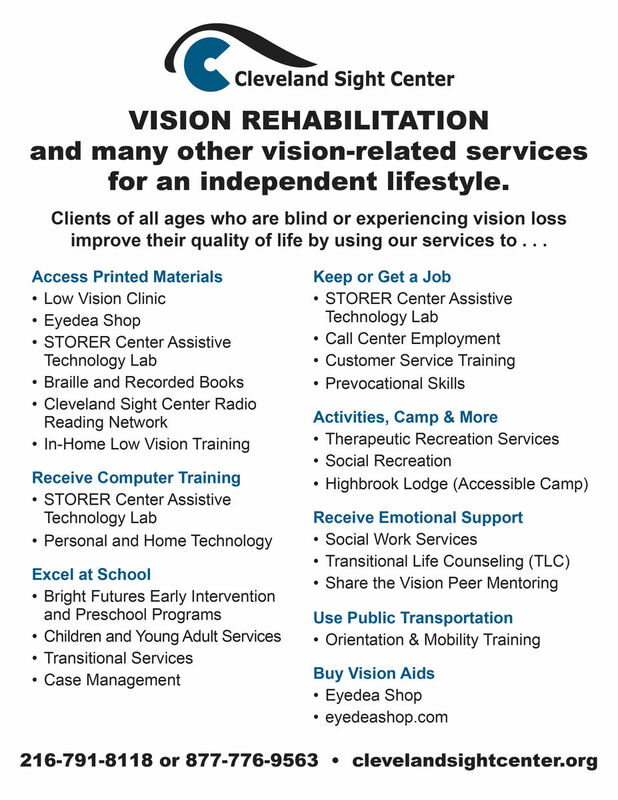 Cleveland Sight Center offers programs and services that are designed to enhance the independence, education, career and support opportunities for those with vision loss and their caregivers. Through these programs, CSC’s dedicated staff helps clients achieve ambitions, reach goals and thrive in the world today. These opportunities are available to those of all ages and are developed to fulfill the specific needs of each target audience. CSC provides services to assist those who are blind live independently. These services range from navigating around the home to cooking to laundry. In addition, services are available to enhance how partial or remaining vision can be used effectively with various low and high technology aids to improve self-sufficiency. CSC offers programs for those transitioning into adulthood and for adults and seniors experiencing vision loss. CSC delivers superior services for students in Northeast Ohio who are blind or have low vision. CSC offers school districts collegial assistance for teaching staff, parental support and other educational resources and assistance. CSC also provides specialized education to preschool children at Bright Futures Preschool, located at CSC’s headquarters. The organization offers comprehensive employment services that prepare teens and adults to enter the workforce, work with sighted coworkers or return to a job after experiencing vision loss. The career preparation programs include employment training and on-the-job support. CSC staff understands the hardship and fear associated with vision loss. CSC offers support programs to those experiencing vision loss and their families. During these sessions, clients and volunteers meet regularly to share experiences, insights and the special camaraderie of those who have lost vision. Our Audio Recording department can record a variety of print materials into accessible audio formats. We can record books (including text books), legal documents, and other printed materials requested. Our Readers are all screened and trained for professional results. Recordings can be put onto CDs, MP3 downloads, flash drives, or DAISY book cartridges. For more information, please contact: Glenn Wickline, Media Specialist, at 216-791-8118 or gwickline@clevelandsightcenter.org. Cleveland Sight Center has a long history of being on the forefront of Adaptive Technologies. Our service providers have over 50 combined years of experience in technology and assistive technology services. Our team includes two RESNA (Rehabilitation Engineering and Assistive Technology Society of North America) certified trainers: Randy Knapp and Jennifer Dean. We also feature an Occupational Therapist, Erin St. Denis, OTR/L, who specializes in working with individuals with vision loss. We can assess individual needs to determine which adaptive technology will help overcome barriers at work, home, or school. The outcome is a personalized recommendation report with specific suggestions for software, equipment, and implementation. We can even do on-site workplace assessments. We offer classes in typing, general computer use (PC and Mac), Microsoft Office, iPhone and iPad, and Android technologies. Adaptive software can include screen magnifiers, screen readers, and speech-to-text input. We also diagnose, install, configure, or troubleshoot assistive technology software and devices. For more information, please contact: Susanna Meles, Manager of Rehabilitation Services, at 216-791-8118 or smeles@clevelandsightcenter.org. CSC offers summer programs to children, teenagers and young adults to keep them busy, engaged and continued learning during the summer months.